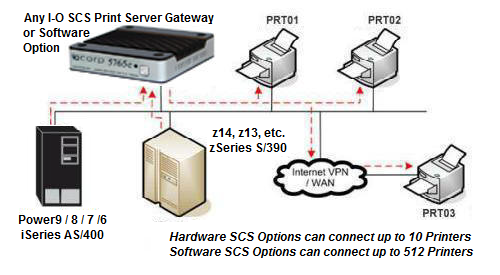 I-O Print Servers, Print Server Gateways and SCS Print Server Software provide full-function printing for network attached printers connected to IBM Power8, Power7, iSeries AS/400 i5 or zSeries S/390 zSeries printing over an Ethernet network, as well as printing from Windows, Unix and other IP platforms.. If you need IPDS connectivity for your laser printers and MFPs, click here to see I-O Corporation IPDS Printer Connectivity Options. The various models support from 1 to 10 printers and feature I-O's field-proven IBM printer emulations. Combined, these unique characteristics enable users to share printer resources even when several different operating systems are in use. In addition to operating as an Ethernet LAN print server, the I-O print servers support AS/400 - iSeries and IBM Mainframe printing over TCP/IP, SNA (APPC), and AnyNet (SNA encapsulated in TCP/IP). 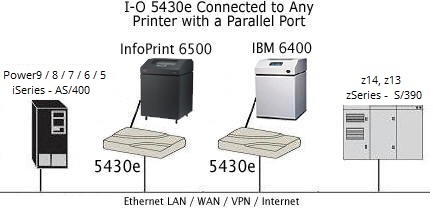 Using any one of these protocols, the allows the LAN attached printer to offer the same reliable, full-function IBM host printing support as a direct system-attached 5250/3270 printer. These protocols also offer users one step set-up (auto-configuration) as well. If you have a requirement for IPDS Laser Printing over your TCP/IP network from your iSeries AS/400 or zSeriex Mainframe, click here for information on the 5735e IPDS Ethernet Print Server Gaterway. These print servers offer the same reliable, full-function IBM host printing and control found with traditional direct attached Twinax/Coax printers. With the 5430e Print Server your printer is configured as a true "Device" printer and not a "Remote Out Queue Printer". Your IBM host print jobs are not lost in the black hole of "Remote Out Queue" LAN printing. They provide bi-directional communication between the printer and the IBM host, allowing error reporting and page range printing.